Alrighty guys! This addition of Christmas morning brunch is savory! We have pomegranate mimosas and overnight cranberry cinnamon rolls but I wanted to make sure to include something savory and healthy to balance out the meal! 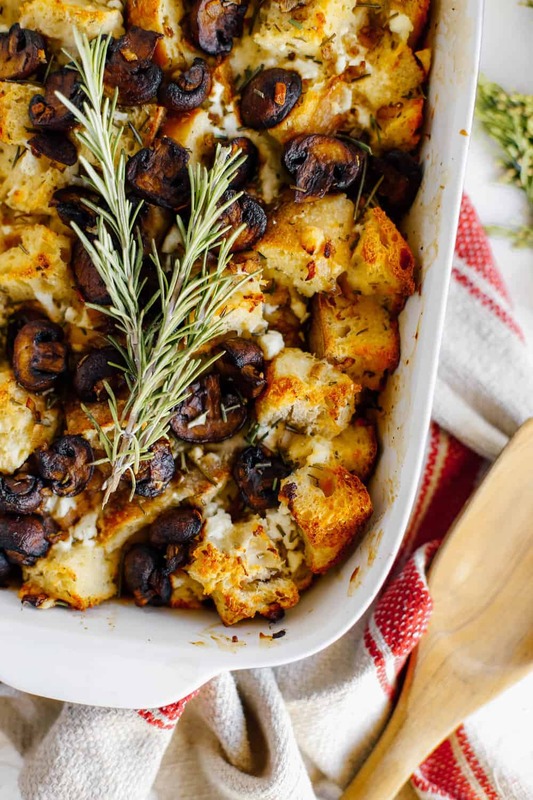 This strata is full of all the cheeses and meaty flavors but is actually still vegetarian! Any good egg recipe I think involves some really amazing browned meaty mushrooms. The mushrooms and the goat cheese make you feel like you’re having this amazing fancy french breakfast in the comfort of your own home! What could be more perfect on Christmas morning?! For this recipe I used a seedy, herb filled bread from sprouts. You could certainly just pick up an easy french bread or baguette for the same feel! 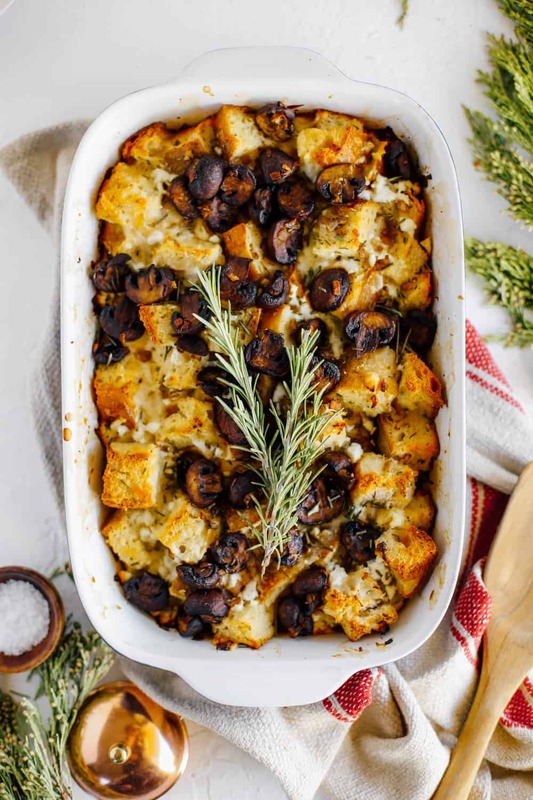 If you do want to add some meat in I would totally suggest some crispy bacon or pancetta with the mushrooms before adding them into the bread cubes. Honestly, the possibilites are seriously endless! This friendly dish can be taken any which way 🙂 Scroll below to find a recipe that I love to make on the regular! Nothing starts a holiday brunch quite like a mimosa. I swapped out traditional orange juice for pomegranate and added a fresh rosemary sprig for the ultimate winter garnish. Cheers! If you didn’t know, I’ve been on a serious goat cheese kick. 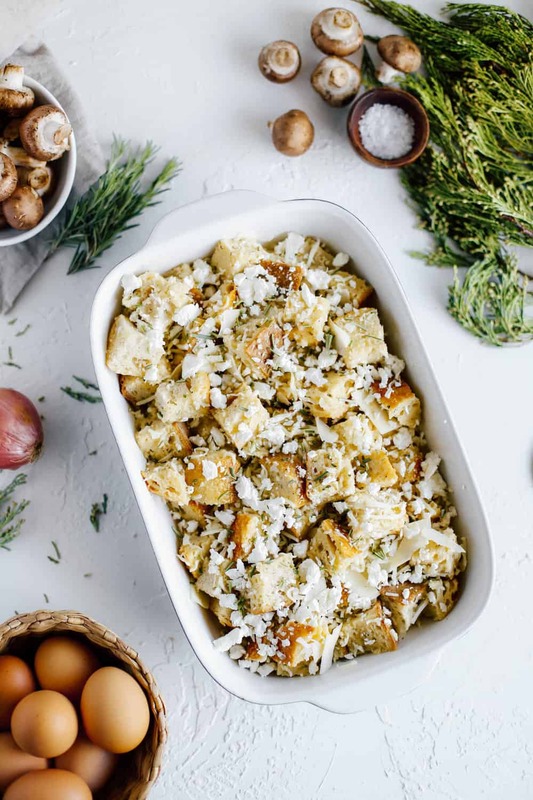 For the last month every dish of eggs has gotten a good few dollops of goat cheese and this strata is no exception! Stratas are like a wholesome quiche filled with delicious cubes of bread. Very cozy and great for winter brunches. This particular one is filled out with browned butter mushrooms, shallots and lots of mozzarella, parmesan and goat cheese! I know for a fact that all of my readers seriously love cinnamon rolls. When I post a cinnamon roll recipe like this one or these, I can usually trust that the recipe spreads like wildfire. I still can’t get my finger on why they are so popular but, I HEAR YOU! So today I am kicking our brunch menu off with these overnight cinnamon rolls that will make your Christmas morning so much easier! Light and fluffy tart cranberry cinnamon rolls topped off with sweet orange glaze. Enjoy! Preheat oven to 400 degrees Fahrenheit. Heat butter until melted and add mushrooms and shallots. 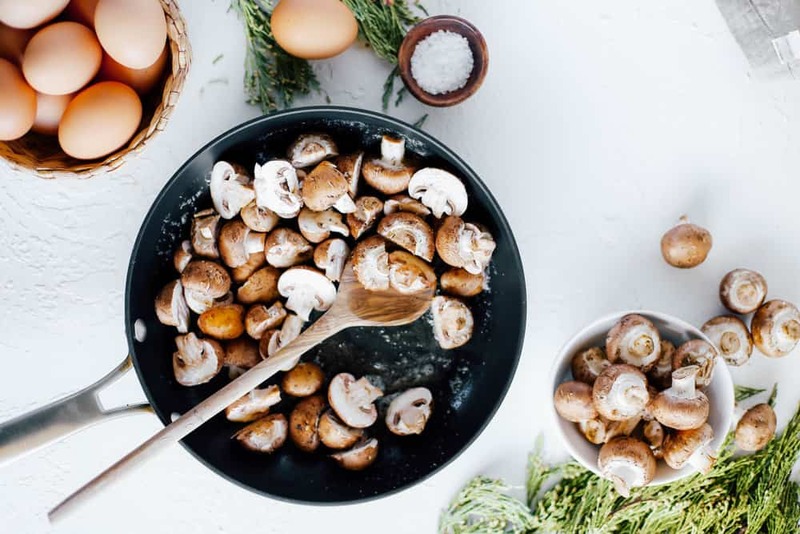 Cook on medium heat until mushrooms are tender and slightly browned. 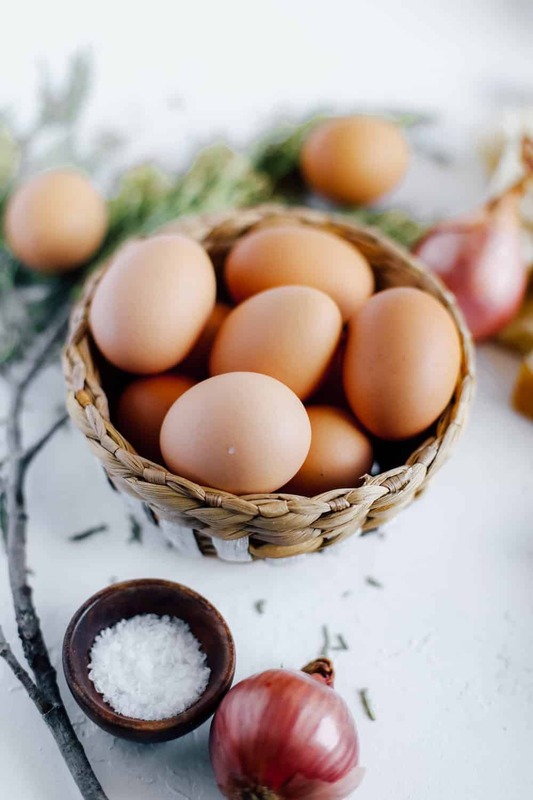 In a large bowl whisk together eggs, half and half, rosemary, salt and pepper for 2-3 minutes or until light and fluffy. Grease a large casserole dish (or non stick spray) and add in bread cubes. Pour egg mixture evenly over bread cubes and lightly toss. 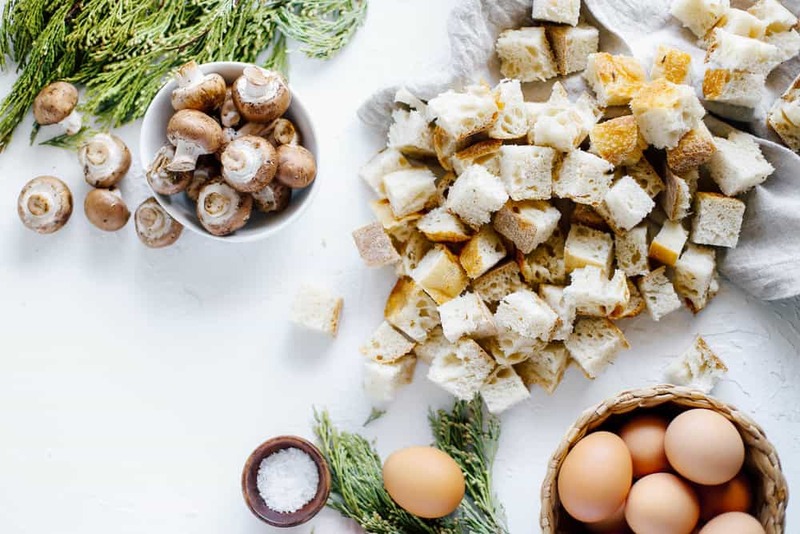 Sprinkle mozzarella, parm and goat cheese and mushroom mixture evenly over the top of bread cubes. Tent with tin foil and bake for 30 minutes. Remove foil and continue to bake 10-20 minutes until top is golden brown. Serve nice and hot!